Proper Ways to Handle a Bully of Any Kind. — Bullies Keep Out! Proper Ways to Handle a Bully of Any Kind. We all know bullying is a big problem. It can make kids feel hurt, scared, sick, lonely, embarrassed and sad. 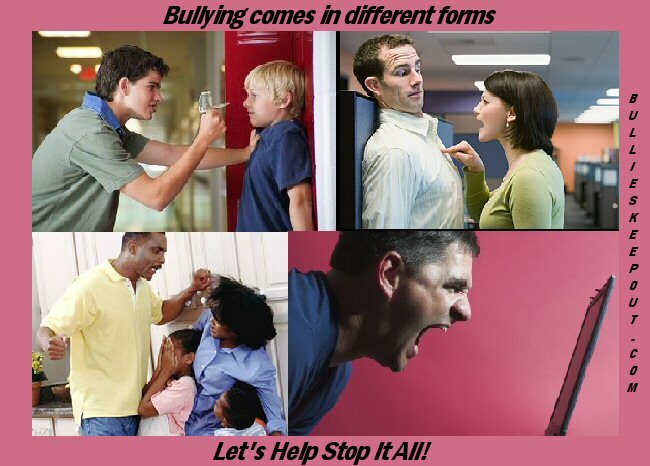 Bullies might hit, kick, or push to hurt people, or use words to call names, threaten, tease, or scare them. Most people think of bullying is only in schools and something children deal with but that’s far from true. Bullying happens in homes, workplaces, online and well just about everywhere we go. So what do we do? It would be great if we could just say STOP IT and they would but that’s not how it happens in the real world. Most the time all it does it make it worse. Below is some tips on how you can handle bullying in different situations. Before we jump into tips for handling bullying first I think we need to explain WHY people bully. Figuring out why your particular bully is being the way he or she is might help you be able to handle the situation better. Attention. Some bullies are looking for attention. They might think bullying is a way to be popular or to get what they want. Most bullies are trying to make themselves feel more important. When they pick on someone else, it can make them feel big and powerful. Home Life. Some bullies come from families where everyone is angry and shouting all the time. They may think that being angry, calling names, and pushing people around is a normal way to act. Some bullies are copying what they’ve seen someone else do. Some have been bullied themselves. 3.Maturity. Sometimes bullies know that what they are doing or saying hurts other people. But other bullies may not really know how hurtful their actions can be. Most bullies don’t understand or care about the feelings of others. 4.Power. Bullies often pick on someone they think they can have power over. They might pick on kids who get upset easily or who have trouble sticking up for themselves. Getting a big reaction out of someone can make bullies feel like they have the power they want. Sometimes bullies pick on someone who is smarter than they are or different from them in some way. Sometimes bullies just pick on a kid for no reason at all. With that being said once you have identified the type of bully you’re dealing with here are some tips to resolve the issue the best way you can. Work your way around the bullies. Try and avoid them in school, work and social situations. If they go somewhere the same way you do, try a different way, if they can’t find you, they can’t bully you. Don’t go anywhere near them,try your best to avoid them but don’t show that you are avoiding them. They will usually read this as fear/success, and they will bully you more as a result. Show minimal reaction to bullying. Do not show the bullies that you feel hurt if they do something that makes you uncomfortable; just walk off. Bullies gain satisfaction from making others feel hurt or uncomfortable, so giving them a reaction may only encourage them further. The bully wants attention and if you show them that they are emotionally hurting you, they will get more pleasure out of doing this. You cannot talk sense to an irrational person. Walk away with dignity, saying you have better things to do with your time. If it continues, stand up for yourself. If it continues or does not continue, be sure to stand up for others. Do not make jokes at your own expense to try to prove that there is nothing they can do to hurt your feelings. This will only please them, and they will often chip in with their own ridicule and humiliation to lower your self-esteem. If you must, crack a joke about their bullying. Bullies can’t stand this because it takes power away from them and makes them see they are not affecting you emotionally. Avoid insulting the bully if they have a history of being able to physically bully you, as this instigates a conflict that you can’t win. Instead of exacerbating the situation, walk away. Report this to an authority figure if you believe you are in danger. Help others. Bullies are people who try to make themselves look good. All they want is attention take that away from them and they have nothing. But you can look better by helping others! Try asking the bully why they pick on people. There is never a good enough answer to this question. If you don’t want to ask the bully this force them into being uncomfortable but, make sure your not bullying them! Tell someone the second you feel threatened. If you’ve read any terrifying stories about people being bullied for 8 years, the main problem is lack of communication. Never try to get revenge. It will please them even more. Try the silent treatment. Never say anything bad to be defensive. Doing what the bully does for “revenge” means you’re just as bad as they are. Walk with a purposeful confidence and a ‘don’t you dare mess with me attitude. Don’t take anything bullies say to heart – they are not worthy of your tears! Do not let their words stop you from achieving your goals! Show confidence, and show to them that their words have no effect on you. Some bullies might just be jealous of you. They only bully you because you have a great talent that they don’t have, so be proud of what you are doing. Calling names is not fun. Actually, what’s deep inside those bullies is they don’t have the guts to do what you do the best. Whatever you do, do not actually fight the bully unless you are in serious danger of injury. If you feel this is the case you might be attacked you can always take karate classes, self-defence classes and other types to make sure you are prepared but once fighting should always be last resort. Get support! Talk to your friends, chat with a Bullies Keep Out mentor, call a support hotline. Don’t try to handle a bully on your own!